From Glassmen's Web site: June 28, 2006 The corps took a much needed day off Wednesday, making a one-day stop in Belgium between their performances in France and the Netherlands. All the equipment was loaded onto the truck borrowed from the Dutch drum corps Jubal, and the buses were once again packed with luggage for the next stop on tour. After a leisurely morning, the corps departed from Saint Quentin, France, for an afternoon in Bruges, Belgium – one of the most beautiful cities in the world. 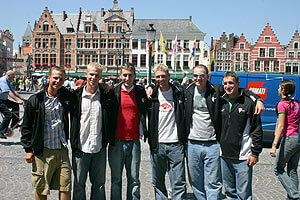 Six members of the Glassmen drum line pose for a quick photo in the main Market Square of Bruges. The city of Bruges is so packed with sights and sounds and activities that could never be covered in one short day. But if nothing else, many of the Glassmen treated themselves to some of the best food that the region has to offer in any of the hundreds of cafes that line the streets. You certainly can't say you've been to Belgium without having a plate of fries with mayonnaise, a pot of steamed mussels in sauce, or an honest to goodness Belgian waffle topped with ice cream and chocolate sauce. It was the best way to end a most perfect free day! The corps boarded the busses again at 8 p.m. and headed up north to Dordrecht, Netherlands, where they will spend two days in rehearsal in preparation for the Jubal home drum corps show, "An Evening with the Stars," on Friday night. The Glassmen have been making frequent updates while on their European trip. Follow along on www.glassmen.org.